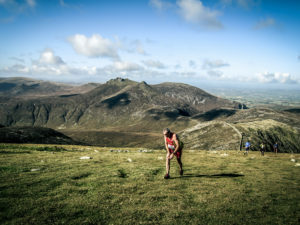 The Bank Holiday weekend saw six well respected mountain runners from Northern Ireland complete the Mourne 500 Challenge, a gruelling run that requires participants to reach the summit of every peak in the Mourne Mountains which measures over 500 metres in height. On Saturday 12th July 2014, a four strong grouping of Dale Mathers (Newry City Runners), Stephen Wallace (Unattached), Dominic McInerney (Unattached) and William Marks (Mourne Runners) braved tough weather conditions to complete the route. After starting at Ott Car Park, the men were forced to use their navigational skills because of poor visibility; having completed the challenge, they returned to their starting point (participants are required to start and finish in the same place) in 15:44:00. 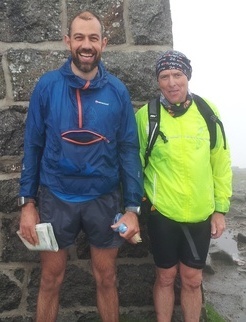 On Monday 14th July 2014, Murlough AC’s Phil Hodge and Team Purple’s Pete Grant set off to complete the challenge, which had been completed by nine people prior to this weekend; interestingly, the challenge record is held by Billy Reed (East Antrim Harriers) and stands at 13:10:00. Phil and Pete put in gritty performances, covering approximately 41 miles and 39 peaks (incorporating 14,000ft of ascent) in 14:17:00. Full details of the Mourne Challenge can be found HERE. This includes the ‘Hall of Fame’, which will be updated to reflect the weekend performances as soon as the routes are ratified.